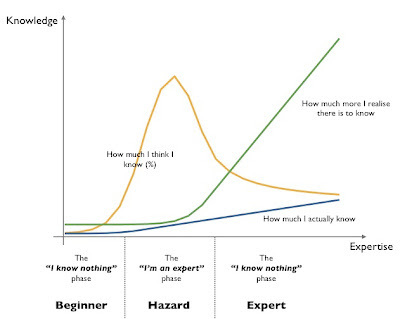 are "I know nothing", Hazard and "I know nothing" . Figure 1 - The three stages of expertise. P.S. Just in case, the above is meant to be a joke and a social commentary on the hubris of self declared experts. It's based upon precisely nothing. Just because someone draws a graph, doesn't make it real. Amazingly simple. And I still know nothing! There's also a line that measures your awareness of how much other people know. As the saying goes, "When you know everything there is to know about the subject, they give you the Bachelor's; when you realize you don't know everything about it, they give you the Master's; and when you realize that no one else knows anything either, they give you the Ph.D."
All of these stages are important. I know that. Have you seen this cv vs resume service before? Tell me.